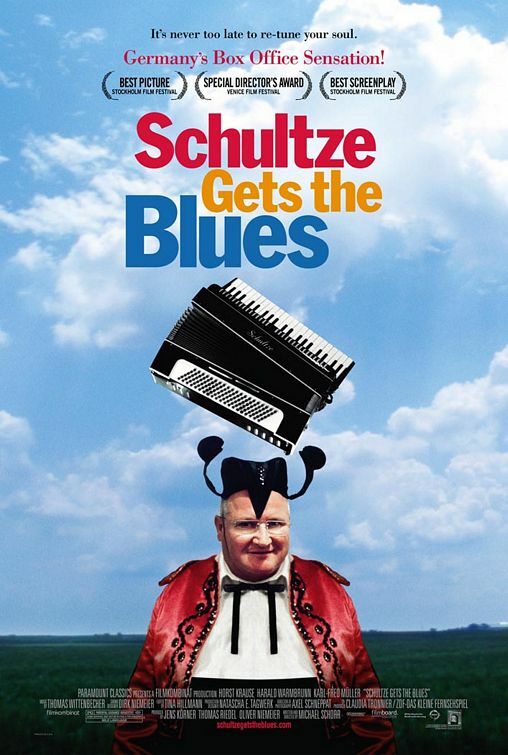 In SCHULTZE GETS THE BLUES, a German movie now on video, Schultze is a recently retired miner known for his accordion playing who goes to Louisiana in search of the Cajun blues music he has come to love. Rated PG, SCHULTZE GETS THE BLUES is a very droll movie with a light Christian worldview, but it moves so slowly that it's a chore to watch. SCHULTZE GETS THE BLUES is a very droll movie shot in a Bauhaus style. Each scene is set up as almost a static photograph. The movie moves so slowly that the viewer could engage in a multitude of activities and not miss a beat. Schultze and his two friends, Manfred and Yurgin, are given early retirement from the German mining company where they work. They have no idea what to do with their spare time. They meet for various meals, drink beer, fish, gamble, and pursue inconsequential activities. Schultze is known for his accordion playing of polka songs at the local music club. One day while fixing dinner he hears some Cajun, blues type accordion playing with a fast tempo. He is hooked and starts playing this American music. His friends indulge him, but the music club is horrified. Even so, the sister city of the German town in the United States, New Braunsfel, Texas, invites the town where Schultze lives to send someone to participate in the annual music festival. They send Schultze. Somehow, Schultze gets lost in the bayous of Louisiana. He discovers the music he heard on the radio. He meets some nice Americans and dies. The funeral is very Christian. It is surprising that this movie has done well. It is almost an anti-movie, just a series of still photographs. It moves with a dreadfully slow pacing. Static conflict would be an overstatement. The whole movie could have been condensed to 10 minutes. Visually, it is very beautiful. The characters, however, are totally wooden and unappealing, most likely on purpose. The dialogue is sparse and often irrelevant. Morally, SCHULTZE GETS THE BLUES is not a bad movie. It makes some good points and it ends on a Christian note. Neither Pasolini, Bergman, nor Fellini lovers need to worry about this film becoming a cult classic. It is a chore to watch. (C, L, V, A, D, M) Mild Christian worldview with an overtly Christian funeral at the end; four obscenities and two mild profanities; man has heart attack; drinking; smoking; and, gambling. In SCHULTZE GETS THE BLUES, a German movie now on video, Schultze is a recently retired miner known for his accordion playing of polka songs at the local music club. One day he hears some Cajun, blues type accordion playing with a fast tempo. He is hooked and starts playing this American music. His friends indulge him, but the music club is horrified. Even so, the sister city of the town in the United States, New Braunsfel, Texas, invites the town where Schultze lives to send someone to participate in their music festival. They send Schultze. Somehow, Schultze gets lost in the bayous of Louisiana, discovers the music he heard on the radio and meets some nice Americans. SCHULTZE GETS THE BLUES is a very droll movie, but it moves so slowly that it's a chore to watch. Each scene is set up as almost a static photograph. Visually, it is very beautiful. The characters, however, are totally wooden and unappealing, most likely on purpose. The dialogue is sparse and often irrelevant. Morally, SCHULTZE GETS THE BLUES is not a bad movie. It makes some good points and it ends on a Christian note.